One commonly-voiced concern about the increasing numbers of electric vehicles in urban areas is their silent engines. Unlike a internal combustion engines, electric motors make virtually no noise and can easily escape notice. The potential danger is real in places such as the Netherlands, where bicycling is the major form of transportation and a part of the local culture. As electric vehicles become more common in cities, they can easily (and dangerously) blend in with the mass of bikes that share space on city streets and bike paths. Bicycle collisions with pedestrians are common in Amsterdam; such an impact with a 250-lb. electric scooter could cause serious injury. The scooter horn sounds like “leker leker,” Dutch for “tasty tasty.” The engine noise is a deep male baritone uttering, “Domino’s, domino’s, dododomino’s, domino’s” with “mmmmmmmmmmm leker” tossed in when the scooter accelerates. Humorous, indeed. (We suspected this was a hoax when we first saw it.) 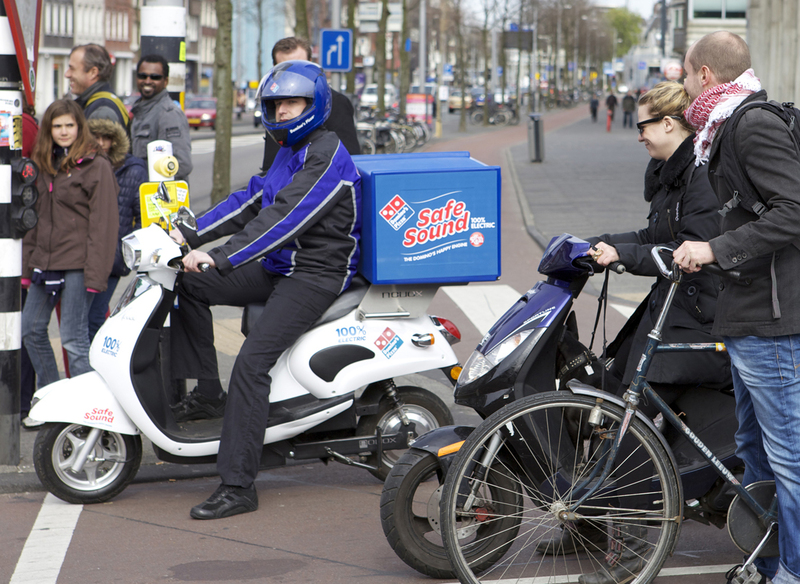 Dutch Domino’s scooter delivery riders may quickly tire of the novelty and bystander reactions, though. The sound is more than a little reminiscent of a famous Vespa “Papapapapapa” commercial from the ’60s, in which a voice imitates the scooter’s iconic two-stroke engine noise. According to reporter Alix Bryan, Scooter theft in and around the scooter-dense city of Richmond, Virginia is sharply on the rise.